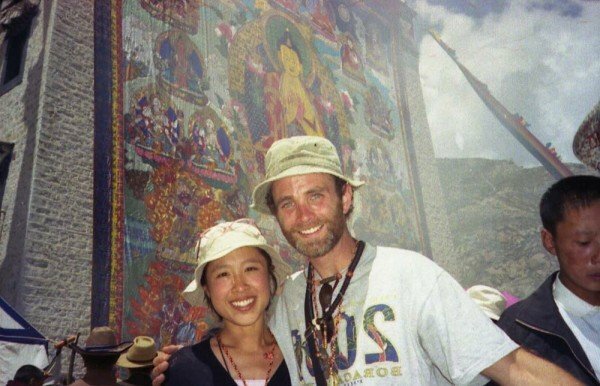 Jozan Magazine has asked Mike Petras, traveler and collector of Tibetan antique rugs and artifacts, tell about his life and travels in Tibet and about his affection for Tibetan rugs. In hindsight, dumb luck is where whose true path can be found. I realized life was all too short in 1997. I can start out most of my stories at this point. Previous to this I hadn’t understood much to do about anything. I didn’t know this at the time. Romantizing a bit, but it was like being reborn. A state trooper pulls me over, we talk about fly fishing for an hour on the side of no mans land in the middle of Nebraska. Out of my ruck sack I pull out my helmet, he finally does write me the ticket, I tell him I can’t say thank you. He smiles and “It may save your live.” A lot of luck to this point, had me tuck away my finances in my sisters name, condo and university were recently paid off. I had planned to venture into America for 5 years on bike. About 5 am the following morning, a trucker knocked me off the road. He stopped, apparently saw I was still alive, stole my saddle bags and then called 911. Nameless faceless for whatever jerk he may have been for taking my bags, he saved my life. Thank god, the hospitals wrote off hundreds of thousands of dollars, better than socialized medicine! After a year of surgeries, I asked my leg be amputated. I booked a flight to Asia 4 months later. Backpacking, living life with a simple motto. Sleep cheap, travel cheap and eat well. I had thumbed up from Laos to Yunan Province, Shichuan, Qinghia, Gansu, Xingiang. Miraculously extended my visa to 6 months. What magic was behind that effort. My course, as always is similar to the wind. I somewhat define a goal and then let circumstances guide me. I like this because I seem to get off the beaten track. 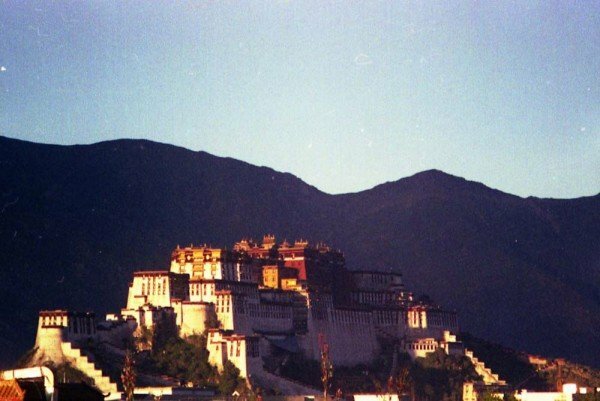 Traveling once Eastern Tibet and having had my visa extended, I realized this to be the perfect time to experience Tibet. 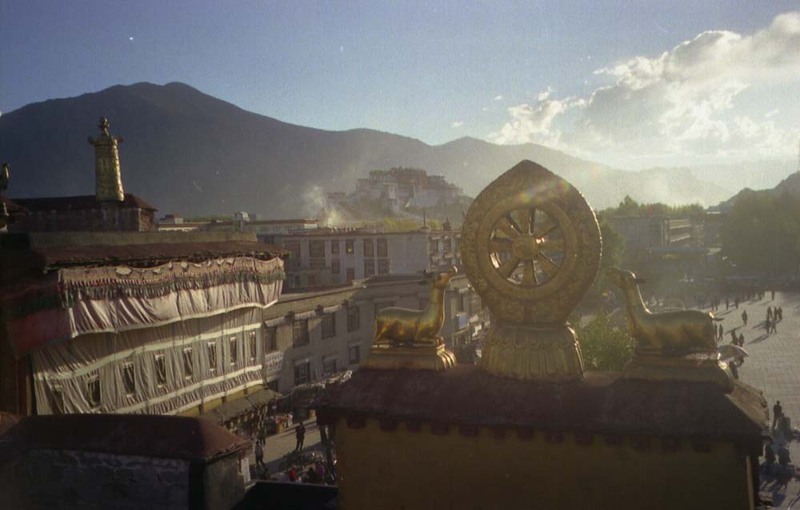 What passing knowledge I thought I had of Tibet, about nomads was everyday redefining itself. The peopled mirrored the landscape. Dangerously strong, determined and harsh. Gentle to those who do not mean harm, open as the night and the innumerous stars that, at such high altitude light the way. At this point in time very little or no English was spoken and that was fine, hand gestures served well. Often traversing the road in open bed trucks, I wouldn’t have been able to speak having faired no better than an open water bottle in the back. Now English is spoken widely. When the chores of life are made easy, we need to balance this convenience. I went to monasteries in Kandzie that in the last 5 years have been completely rebuilt. I say this in particular because I later took my wife to be, to see the splendid wall paintings and thangkas of these 2 special monasteries but they were “renewed”. From the ground up, new monasteries have sprung. Development has its rewards too, the roads are now paved. This renewing process has been quick to the punch so I feel more fortunate having seen more than I could truly appreciate. This trek along the Tibetan border, served time well – Usually being far from the city there was little I could buy unless I was willing to drag it with me. Serving an apprenticeship to beauty, there is no greater desire than being able to buy something and yet can’t. So I used the time to ask, further study Tibetan history and art. The whole time on the Chinese side, you could feel the push of expansion. Newly built towns, old towns with newly constructed 5-6 story structures laid rotten and empty. The purpose of socialism and a billion people- the government must continually renew, and build. For China, there was no alternative but west- into Tibet. And for me, finally I hitched in to Tibet. Being my first time hitching to Lhasa, it was not nearly as exciting as it was the times after but the ease was welcomed. Bless the comfort a 4×4 “China Tibet Tours” truck can offer. No sooner had I dropped my bags and went to the market, I met a Tibetan Rug dealer. What an elixir I became privy to. This I gather from subsequent travels was the last time of the great rug buyers. At this time there were 8 buyers. Each of these men were proud to show the prowess in the hunt for a great piece. Where I was most fortunate, is that most of these men came and went within the first week or two I was there. They had their sellers, connections and knew what the market could bring and how much they could afford to buy rugs. They had investments to recoup. I went house to house, there were certain back alleys behind the Jokang where a underground jewelry and stones market was, rug market, and another for items coming directly from the monastery. This cultural utopia would be the last on earth to be witnessed. The world being as it is, it is amazing to find a culture where traditional garments are worn, local customs practiced seemingly unabashed by western civilization. I don’t like culture on display, a sort of tourist in a zoo atmosphere. The Tibetan way of life would be dissembled by economics and disseminated by internet quicker than any ideology could undo. A fervor, likely the wrong word, I spent endless time buying as much as I could afford. God blesses those with blind faith, after 3 months in Lhasa, my 4×4 “China Tibet Tours” was so full I had no room to share the expense to the border. The driver had no room to see out the back window. After reaching Katmandu safely, I was told bringing out as few as ten rugs is difficult. Apparently, He blesses the ignorant too. At this point, unloading my rugs at the Hotel California, I started to realize I became a collector. I paid far too much to become a dealer! 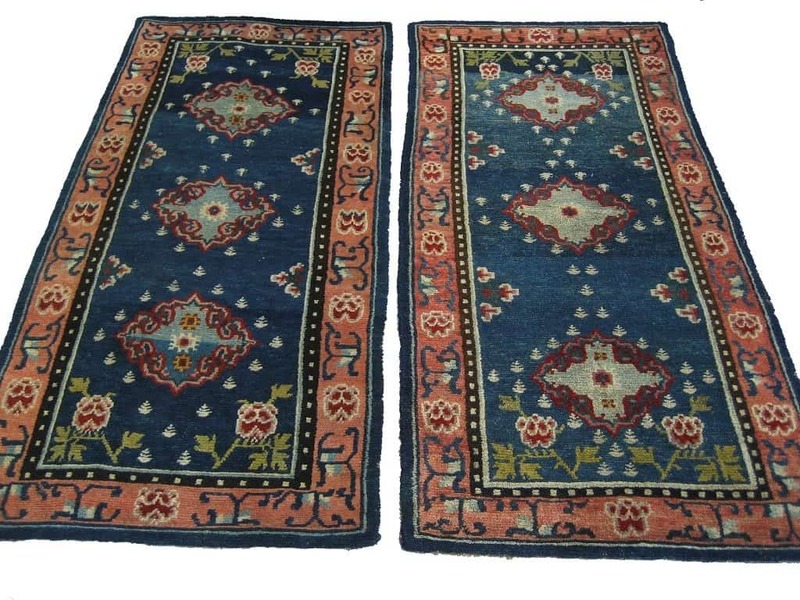 The attraction of antique Tibetan rugs, from a purely aesthetic view is the folk art. 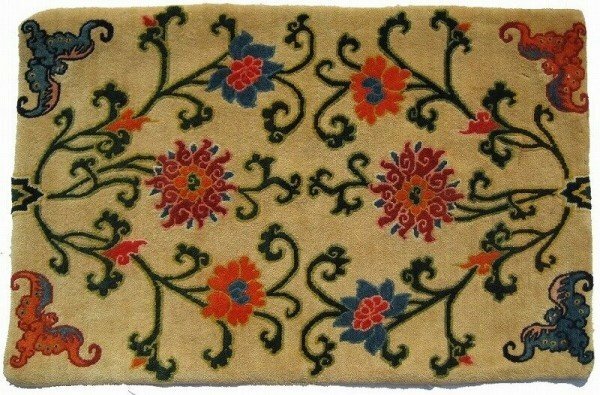 Because the physical antique rug represents the Tibetan people better than anything. I say the antique Tibetan rug is the best pure representative rug of any culture. I believe a rug collector would be hard pressed to dispute my claim. First note is the material. 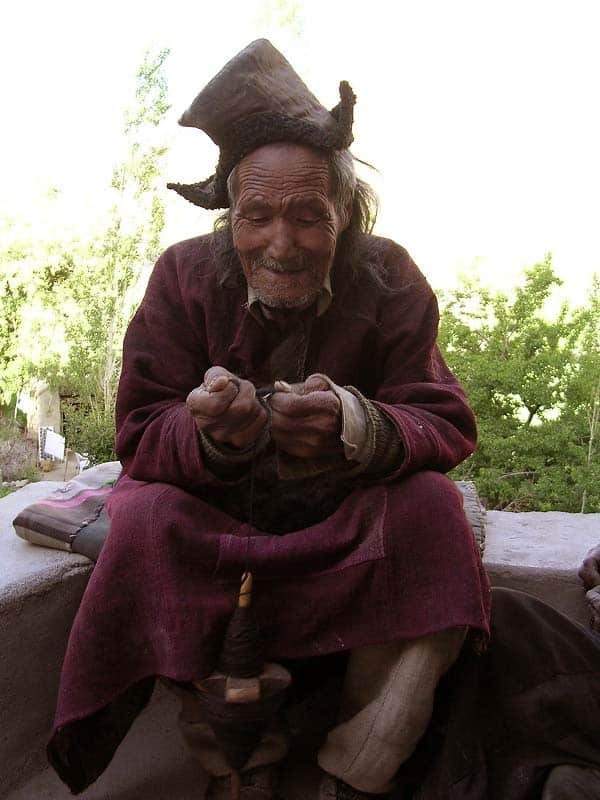 The wool is sheered from sheep and yak that live at the high Plateau on earth and are indigenous. The Yak is now on the endangered species list. As Tibetan history became inscribed in our dreams and folklore in the late 19th century, the sheep and yak were essential to this imagery. Even today, the sheep and yak are the staple diet in Tibet. The average elevation of Tibet is 4500-5000 meters. That is where people live, breath, work and hitchhike. That average elevation is higher than any peak in the lower 48 in USA, and higher than any in Western Europe. The ruggedness of the landscape, the isolation has created these animals to withstand the harshest winters and winds that tear across Tibet. The rich wool that these animals have were used in every part of daily life. Wool woven into the clothes, blankets, tents, and beds all originate with the yak and sheep. This is what early explorers witnessed. The wool is completely unlike any- more oils, thicker. When antique, it creates a wonderful glowing luster. The people and the rugs themselves. Antique Tibetan rugs are as indigenous as the Yak. The loop knot has no equal, no other rug region in the world uses the same knot. The rugs were made in rug centers where there was strict accordance to Buddhist design and knot count, made by an assembly of professionals. Then there was a specific rug center, called Wangden, that created a completely different rug. Unlike the professional rug centers producing for the rich and the monastery, are the village rugs. Aesthetically, village rugs are not always so easy to discern. These were made by individuals either for family use or as an offering to the monastery. Made with love -These rugs often reflected the beautiful rugs witnessed in the monastery when village people went on pilgrimage. Some of these are amazingly well designed served by memory and yet some of these rugs are conceived more from the imagination or Chung (Tibetan beer). As in life, the imperfections often make things more interesting. For example, vegetable dyes are impossible to recreate to the exact match. So sometimes within a rug, a variation in color will occur. 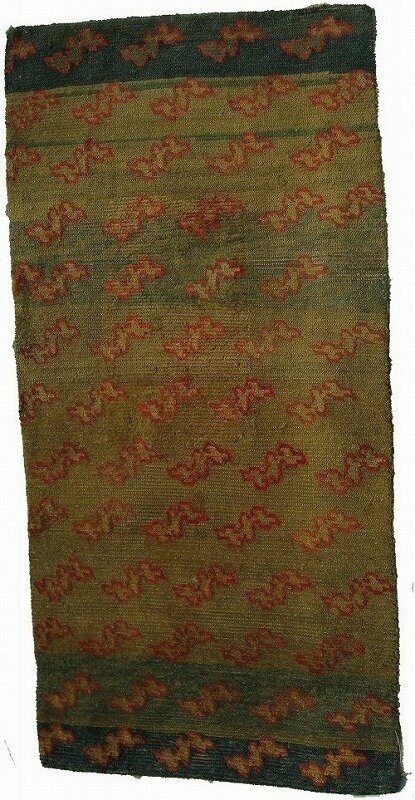 Instead of discarding this rug as imperfect the Tibetans and subsequently rug collectors have come to love this anomaly. Tibetan Buddhist symbolism is ancient; symbols are adorn thru action and of course rugs. What attracts anyone to Buddhism is the concept of reaching a higher plain through good living. As Buddha, we may attain an enlightenment. This purity, is evident in near every aspect of daily life. 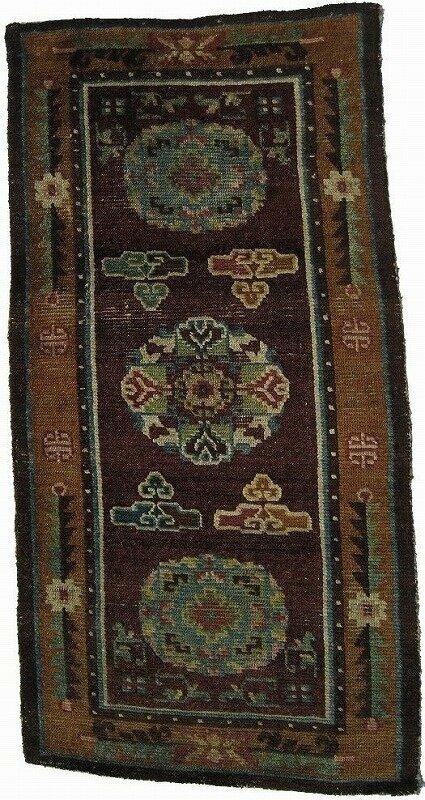 To study symbolism in the antique Tibetan rugs, leads a path thru the culture and religion. A compassionate truth. That can not be said with any other rug in the world. Each of the above, taken as a part: the material, people, rug knot, and depth of significant cultural and religious symbolism would make the Tibetan rug unique. The fact that all are wholly dependent upon each other is extraordinary! 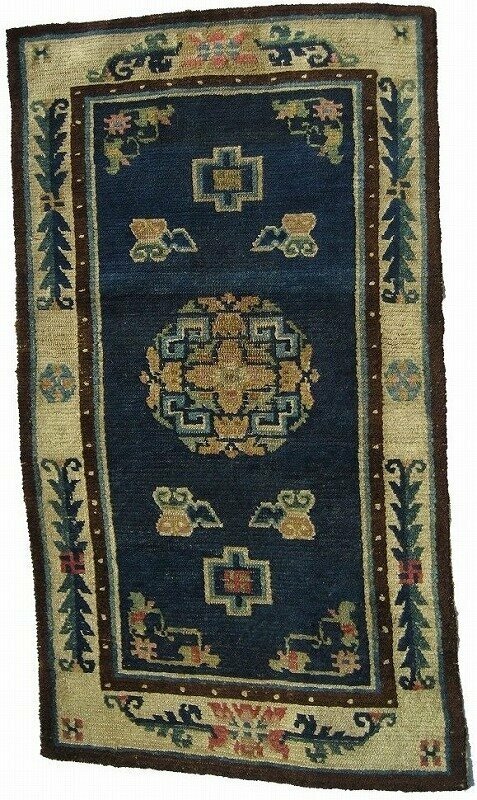 That is why, unlike any other rug, the Antique Tibetan Rug is the most interesting rug. Like Buddhism itself, it transcends time. Everything that we assume of Tibetan History, everything that created an image of Shangra-la, a hidden culture vaguely researched only 115 years ago is embodied in the Antique Tibetan Rug. On a personal level, my collection of Tibetan Rugs allowed me the opportunity to learn about myself. It also provided me the perfect timing to meet my wife. After I left Tibet, I met her in Katmandu at the Hotel California. The most important piece of this story. From that moment, she became my travel partner and my life partner, 4 eyes are better than 2, 2 brains are better than 1. Please visit www.antiquetibet.com – Many great pictures, Indian and Tibetan textiles, Tibetan Art, Buddhist Statues and Thangkas and Rugs.